On a cold January 11th in 2008, with snow on the Mull hilltops; we were at sea aboard the ‘Birthe Marie.’ As she shouldered aside the westerly swell, I watched the towering cliffs of Carsaig gradually come into view. I realised I was revelling in the day as no cold wet conditions could dampen my feelings that at last this boat was on the move again. I didn’t realise it then, but this marked the halfway stage on the boat’s transition from purchase to being the working tool that I could use to help earn a living. Arriving in Iona was an emotional moment. Under a leaden sky in the failing light we were met in the Sound by Gordon and Colin in our dinghy and a small group of folk were down at the pier when we came alongside. 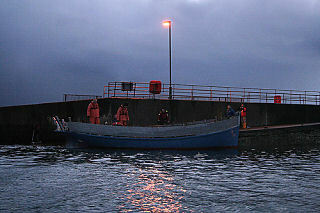 The local ferry ‘LochBuie’ greeted us with a toot - there aren’t so many strange boats arriving at this time of year. We had looked for a suitable boat for nearly two years, with much internet trolling and mooching around anywhere where there could possibly be a candidate no matter how unlikely. 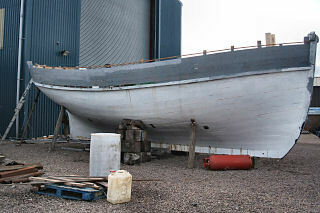 Clydeside ports, west coast harbours, north east boatyards even one farmyard, two trips to Cornwall and so on; about this time I formed a temporary expertise in the second hand traditional boat scene that got close to ‘mastermind’ status! Birthe Marie was found on the internet. A low resolution picture amongst the broker information about her, of the boat out of the water for work on the hull, aroused my interest enough to make a visit to the Tyne where she was at that time moored. That picture revealed a hull shape which I was pretty confident would sail. However after a visit, we didn’t buy her. I reckoned she had too many problems and needed too much change as well as repair to make her attractive. Nonetheless after about another eight months I hadn’t found anything else, and the boat was still on the market, so I approached the broker and asked whether they would take a lower offer. That was in July 2005. Things went from there. 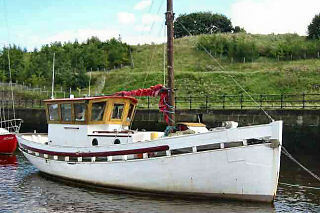 Birthe Marie on the River Tyne before we bought her. The boat was unfit for the journey north by sea so we cast around for a yard in the vicinity which was capable and willing to do the main structural work. We found two places. Fred Crowell was helpful and friendly but had work on which meant we wouldn’t get started for some time; the other possibility was Amble Boat Company which was twenty miles up the coast but could start in six weeks so they said. 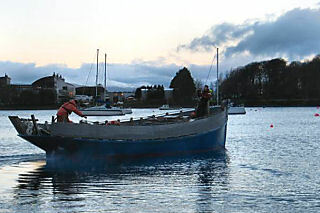 In a gesture of goodwill the seller of the boat agreed to steam her north when there was suitable weather. Considering the state the she was in, I was relieved when they rang to say she was chocked up there after an uneventful passage. It had always been our plan to be ‘hands on’ with aspects of the job, however the intention was to have the ‘professionals’ doing key parts of the work to ensure acceptance from MCA surveyors in the future by having verified standards. 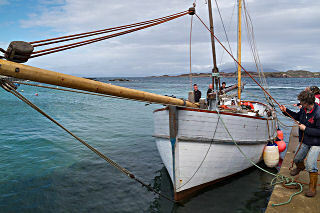 I visited the boat at intervals once our ‘season’ was over running trips on the ‘Freya’ back on Iona, and I got to know the road south pretty well. My own inspection, that of the professional surveyor and the owner of the boatyard’s surveys all roughly agreed what needed done, (and we were all wrong!) 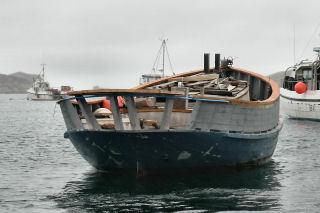 We thought she needed redecked, a new upper stem, some topside planking and some deck beams, and the beam shelf replaced. In addition we proposed to take the opportunity when the deck was being redone to rebuild the cabin arrangement, check over fastenings, the rudder gear and make up steelwork for the stem, chain plates etc and a keel shoe. Initially work at the yard progressed steadily, one shipwright, one experienced woodworker and sometimes a polish labourer worked on the job, although not all simultaneously. On an early visit my son Stewart and I cut away all the old deck and deck structure, leaving the wheelhouse to be craned off after we left. I regret now we didn’t find a way to take it home for a shed! It was a well-made structure of some charm, but not suitable for our intended use. In the end there turned out to be relatively little left of the topside planking which could be retained, either because it had to be removed when the upper stem was being replaced or because it was sprung or rotten or when we found out the whole counter stern also needed rebuilt after removing the old deck. This blew the budget to pieces and came close to making the project go off the rails completely. The solution was not simple but involved borrowing loads of money and tripling the timescale of the job. Additionally I personally ended up doing far more of the work than originally intended; and asking many of my friends and family to help me. However In many ways this has made the whole process a much more rewarding and sociable one. Retired boatbuilder Hector was a helpful and realistic encouragement when you wanted to know how something might be done and showed me the rudiments of caulking (and also lent us his irons when the time came to do the job); such help at key moments probably saved us from making too many blunders. While working on the boat Jeff the shipwright made suggestions based on his observations about the condition of the boat and on his considerable experience of the demands that would later be placed on the vessels structure. One of these was that we should refasten. 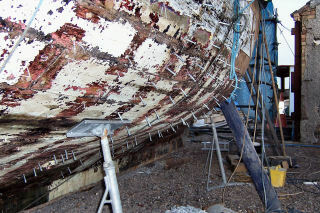 The surveyor had already suggested we assess the condition of the fastenings anyway so I began the process of burning off at every frame to expose the old fastenings and then pre-boring, counterboring, nailing and stopping such that there were a minimum of two new fastenings at every frame on each plank. 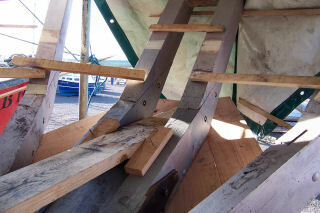 All the new planking was fastened with three or four nails. The nails used were the heavy galvanised dumps used in workboat construction still today. They have an oblong cross-section and a tenacious grip in oak or other solid wood. Refastening into the old oak frames below the waterline was unexpectedly but reassuringly tough going. I have seldom been more physically stretched, it was absolutely crucifying work. Jeff and JJ did all the new plank fastening, and JJ and I did all the refastening, (uphill under the turn of the bilge was the worst). Initially each visit south involved expensive bed and breakfast but offers of a temporary place to kip materialised, firstly via Nick at the yard, and then via a friendship formed with a neighbouring boat owner who was working on his ex-pilot launch adjacent to our berth. Getting to know Gordon Easton was an unexpected pleasure and his unflappable attitude a steadying influence when it came to problem solving. He also welcomed us to his unassuming wee house and later put up with various Scottish bodies sleeping on his floor. His warm kitchen was filled with polished brass maritime antiques, mugs of tea and yarns of amusement and adventure which drew on a rich past during life as a mechanic aboard lifeboats and tugs, not to mention other escapades which I will keep a mystery. 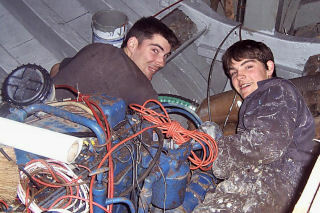 My elder son Neil and I spent one very dirty and exhausting weekend clearing all the seams out for recaulking and sanding down the hull before we primed all the timber. The tarry dust that came off during sanding made it pretty difficult for even the most thorough scrub up afterwards to remove the black traces. All the work in Amble was held back by various factors. One solution to our work and funding ‘shortfall’ was to organise some ‘work parties’. The name has it, these were both very hard working but also great fun. We hired a self catering cottage for a week and invited a bunch of friends from Iona, and also my two grown up sons. Anja came along with wee Freya to visit the yard with the pushchair during the day and the ‘workers’ tackled monotonous tasks like caulking. After a hard day’s work we would walk to the cottage where Anja would feed us large quantities of delicious food she had prepared. Mark and Colin MacDougall caulking. Between one thing and another the boat was in Amble for about two and a half years. We had spent our entire budget and more and the project was miles away from being finished. 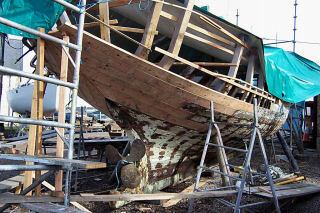 I understand so well why many boat restorations stall and are often abandoned. I was desperate to get the boat home where it would be feasible to work on it without so much travel, and in any case we had no cash to spare to pay for more work. In the end most all my winter earnings were being sent to keep paying the labour and buy materials. I knew that we needed to reach the stage where the boat did not need any more work that I could not carry out, both in terms of skills and in terms of facilities. 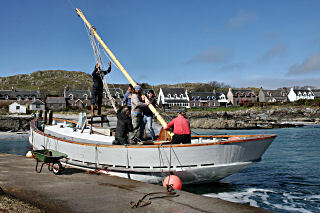 But before we trucked her north, she also needed to be capable of making the passage from Oban to Iona. So we needed Jeff to complete the hull planking and the heavy oak belting, neither of which I felt we could currently manage. To make a safe passage, we really needed a water tight deck, or at least nearly so and finally we also needed an operational engine. 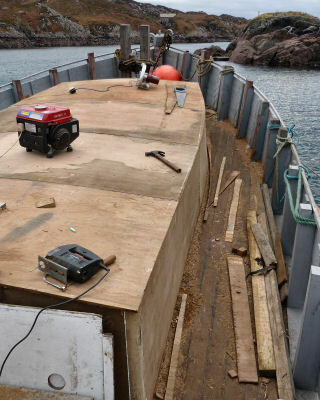 Eventually Jeff completed the belting and the bulwark planking, and they caulked and payed the deck. I made a final longer visit and we steamed in the coamings that meant the deck would keep out the bulk of the water, be it fresh or salt. Gordon and I recommissioned the engine and I remember sending a message to my son on his mobile phone which had no words, only the sound of the Perkins running, he didn’t need much explanation to get the drift. There were a thousand and one things to complete, most of them very basic, like removing old seacocks, fitting anodes, finding a tiller, setting up a temporary ‘morse’ control for the engine, and making and fitting a couple of massive cleats aft so we had something to tie to. Gordon and I also gave her a couple of good coats of antifouling paint and then we loaded all the timber including two trees purchased from the Duke of Northumberland’s sawmill. We ended up with probably about a couple of tons of wood aboard. The low loader was booked and then I went back to Scotland for Christmas. 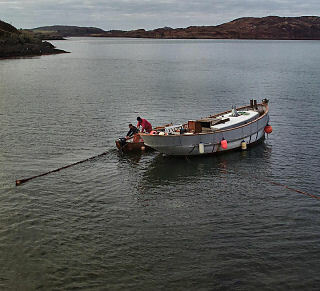 Despite a well handled journey north on the lorry and a successful lift off at Dunstaffnage; Birthe Marie nearly floated away prematurely when storms washed seaweed under her while she was ostensibly still ashore on the hard standing. JJ’s great question ‘will she swim?’ was answered when the storm abated and the travel hoist lowered her into west coast seas. Then began her wintry delivery trip in January 2008. With no alternator and a dodgy starter set up we kept the engine running continuously, a shifting deck cargo in the Firth of Lorne caused a little upheaval, but the passage went reasonably uneventfully with two brief stops for folk to refresh themselves. The initial euphoria at having the boat near home was tempered somewhat when we discovered that the starter ring on the flywheel was badly damaged and that we would have to take the engine out to replace it. 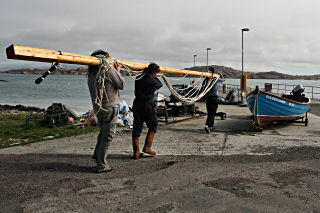 The boat was towed to Fionnphort where a local builder’s small crane lifted the Perkins out and onto a tractor trailer. After some weeks in a barn the engine re-emerged with the starter ring replaced, a new damper plate, a gearbox oil seal, a new lift pump and a coat of paint. All these jobs were completed in parallel with my normal summer work, running trips in our boat the Freya (which of course needed its own upkeep, therefore the amount that could be achieved over the summer season on Birthe Marie was limited). Having the engine back in and starting was all very well, but depressingly I found that the engine clearly had some other issues as it was running smoky and there was a suspicion that there might be head gasket problem! I tried to keep up momentum on the project doing woodwork during the summer of 2008 and resigned myself to taking the engine out again. When the season ended and our neighbour’s boat was heading off to the boatyard for the winter, we asked him if he wouldn’t mind taking our engine with him! During the winter 08/09 the Perkins was opened up and when they found various problems it was resolved to rebuild a different engine of the same type but a later model, which was available at the engineer’s yard. This meant parts would be less of a problem but that the engine would still go back on the beds without having to redo the engine bearers. The gearbox was inspected and reused. Meantime I spent much of the winter building a coach roof to make the interior of the boat into a usable space for the future and complete the water tightness of the hull. 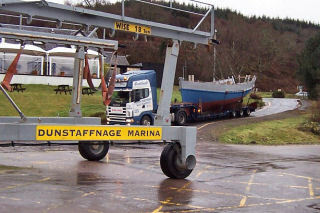 When Davie’s ‘Iolaire’ returned for the 2009 season she brought the engine back and we hastily found another large crane which lifted the engine from one boat to another. Gordon Easton drove up from Amble with a sizable steel fuel tank in the back of his tiny Peugeot hatchback. Before long it was time for me to be preparing the ‘Freya’ once again so B Marie had to take a back seat for another season. In the summer of 2009 I injured my back working on the gunwhales of Birthe Marie between trips on the Freya. I was lucky that this healed as well as it did but I learned a lesson to vary my work, as over use of one muscle group, in one particular twisted bent over position was what had caused the damage. If one part of my body complains now, I change job until something else gets tired! All the jobs still end up getting done eventually. The following winter I was able to continue work, each day commuting by dinghy just over a mile to Bull Hole, where I would spend the day working aboard. Fuel and water supplies, electrical systems, bulkheads, mast steps, cavil rails, cope irons, the list is endless. 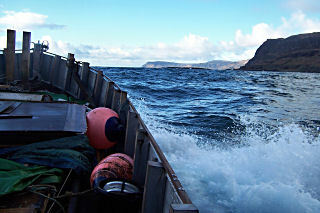 Often I would work on deck during the daylight on heavy woodwork then go below as the short winter daylight ran out. Down below deck out of the wind I would light a Tilley lamp and continue with ‘indoor’ tasks till tea time, then I would head home in the dark by dinghy. Sometimes this was starlit pleasure, sometimes a wet cold battle in the dark requiring certain concentration. I was fortunate that that winter was not one of the stormier ones. From time to time ‘Chance’ the faithful dinghy would have to be hauled up when severe gales came in, but on these occasions there was plenty work I could progress with in the shed at home. 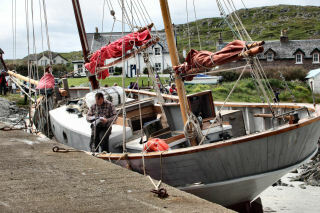 Before long it was time to abandon work on Birthe Marie once again and fettle the Freya up for the 2010 summer season. I found trying to look after two ‘classic’ boats of significant size was counterproductive; neither was being kept to the standard that I wanted, but the only satisfactory solution was surmised by a good friend when he said ‘The only way out is through!’ The Freya’s last commercial season with us drew on and in the August of that year we put her on the market. Still unsold she was hauled out in October so I could get stuck in to another winter session on Birthe Marie. High on the list was getting Ballast sorted out. The process of removing the existing concrete ballast was a slow dirty business. 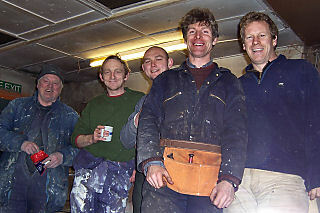 Stewart and I spent some dusty sessions below deck (all the while being nervous of chiselling too far). We put it all into bags for removal, then one day visited Iona pier to remove it and observe what effect it had on her draught. The naval architect was sent all the weights and measurements and photos of the ‘light’ ship. The general verdict was she was going to need a couple of tons of dense ballast. We sourced some lead locally; this was traded for a dinghy repair that I carried out (putting a plank in, in our back garden during the winter). We didn’t have enough but I managed to persuade a friend to sell me a load of pig iron he had been keeping for his own boat. I was still short however so I was searching everywhere for likely additions. We even dug up the keel section of a wreck which had a small cast iron ballast keel. This I cut into pigs with a very large borrowed angle grinder. The lead was an interesting business, we received it in the twisted form of removed lead gutters and piping. It all had to be chopped into small pieces that would fit in a pot to be melted down. A mash hammer and a cold chisel proved the quickest way. Any attempt to use a saw or grinder just resulted in a melting cloying gunge that immobilised the cutting edge. 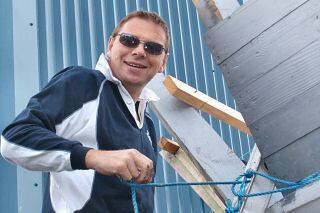 A former crew, Dugald spent hours hammering away at the pier head. In fact once I started melting the lead in my home made gas (triple burner and two blow torches all running flat out) powered smelter we gathered a small crowd who were watching the smelly operation with some bemusement. The ‘cauldron’ was made by cutting an old gas cylinder in half (making sure all the gas was long gone first of course!). Once we had generated the ballast it all had to be very securely fastened in place. Piece by piece as it went aboard it was all weighed. I think in the end her ballast worked about a little under three tons. I was not keen to over do this as we would have made life difficult if the boats draught increased too much, but at the same time I wanted to be sure the stability criteria for the MCA code would be met. We wouldn’t know exactly where were stability wise, until we had finalised the rig, loaded all our gear and run a heel test, then fed in all the measurements to the architect for his computer to number crunch. A trip was made to the local forestry before the winter was out, ’before the sap was rising’. 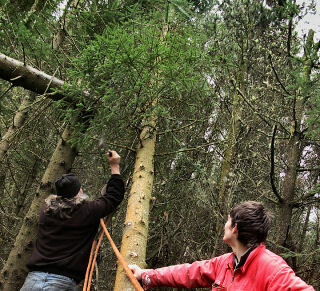 We extracted two likely looking Sitka spruce trees of reasonably straight growth. Another mini work party got these out the forest and down to the water’s edge. There we took over with the dinghy and towed them out to the mother ship and then towed them another five miles by sea to Iona. 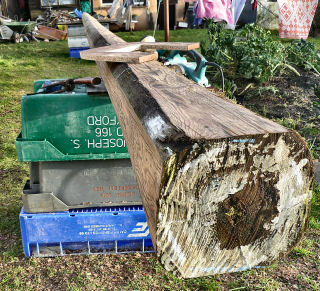 Along with a telegraph pole these noble timbers were the raw materials for the mainmast, mizzen mast, bowsprit and topmast. Much planing took place in the back garden, as I’m sure our long suffering neighbours will testify. In the spring of 2011 I relaunched the Freya to keep her watertight, but as she hadn’t yet sold I had still to put aside some time for her care. The Freya’s license cycle meant she was due for her expensive survey, but we were also hoping to get Birthe Marie licensed the same year; so we made the difficult decision not to relicense the Freya but go for broke, trying to focus on B Marie.The down side of this was that we wouldn’t be able to run trips till she got her ticket. We had to deal with booking enquiries and had to try and guess when we would complete the process and we had to advise enquirers that we weren’t 100% sure when we would begin. Taking deposits for June bookings turned out to be over optimistic. During the Spring of 2011 we were moving into the territory of meeting the ‘code’. Gradually all these strands were coming together, but the season was now under way and we were effectively loosing trade every day, so to say there was a bit of pressure on was not over stating the case. Eventually we were able to call the local surveyor to come and do the heel test. All the measurements of angle of heel were added to the weights data and the rough line drawings I had done, and the architect went off to do his sums. Now we were onto other code requirements, fuel shut offs, fire fighting provision, lifelines, purchasing all the safety gear we didn’t already have, etc, etc. The boat was by now pretty weedy and tatty looking, so we put her on the beach one sunny day and another impromptu work party generated itself. 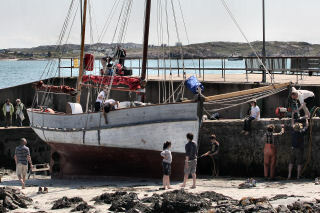 Even two families, friends staying on the island, who we had got to know from previous trips on the ‘Freya’, came down to the shore en-masse and got stuck into first the scrubbing, then the antifouling and also the white topside painting. Anja borrowed a portable gas ‘barbie’, and we had a glorious lunch break much to the envy of some of the queuing ferry passengers on the pier. 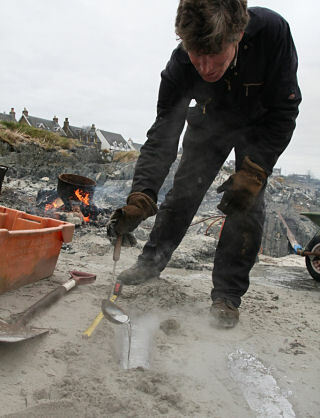 'The Sandbank families', Gordon and Shona help with sanding and painting, June '11. After this we invited the surveyor back for the boat’s ‘acceptance survey’. The surveyor was happy enough only giving me a short list of ‘to do’s. Once these were dealt with he submitted his report to the licensing authority and simultaneously the architect’s stability booklet was completed. We had the pain of cancelling all June bookings and more than half of July, but eventually the paperwork was completed towards the end of the month and we could begin trips. There was no time to sit back and reflect, or to potter about ‘getting used to the boat’, it was a case of get on with it while some of the summer remained! Maybe that was the best way to learn! In at the deep end.